A Progress Article on early Holocene ice-sheet/sea-level connections recently appeared in Nature Geoscience. This was part of a set of studies under the theme "End of a glaciation". Further context is provided by the lead Editorial of the September issue of the journal. A new study on sea-level rise and subsidence along the US Gulf Coast led to a press release by the National Science Foundation and was covered, among others, by the PBS NewsHour, the Times-Picayune and NPR-affiliate WWNO. The documentary series Category Five/Wetlands Watch (also PBS) features a lengthy interview on sea-level rise and its implications for coastal Louisiana (Season 3, Episode 1) . Former postdoc Shiyong Yu published a paper in Science on the cause of an abrupt cooling event 9300 years ago. 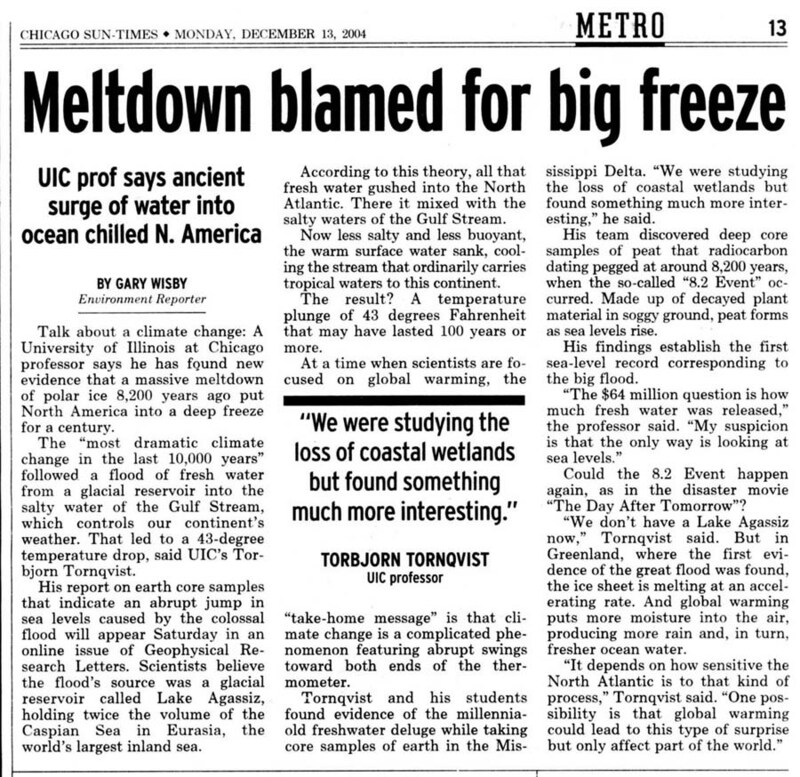 Our studies about sea-level rise and subsidence in the Mississippi Delta have been covered by various news stories. A recent paper in Nature Geoscience was accompanied by a News & Views story by John Day and Liviu Giosan, and also picked up by the New York Times. Our previous work was featured in a press release issued by GSA, as well as a report in the October 2006 issue of Geotimes. Our findings have also aired on television, including CBS News (as part of their State of the Union coverage of January 23, 2007) and The Weather Channel (an episode by the weekly show Forecast Earth to "celebrate" the opening of the 2007 hurricane season). The future of New Orleans is the subject of discussion in the August 2007 issue of National Geographic Magazine. If you are interested in some more information about the origin of our research group at Tulane, check out this interview at Climate Central.